These are the recipes you grew up on. I'm flattered - and hope you enjoy all the recipes as much as we do. 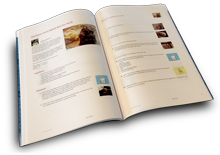 I just found this site and yours is the first cookbook I have seen and it was all I could do not to print the whole thing out. Of course we don't need to do that anymore LOLOL. I hope you don't mind though that I look forward to making yuor chicken pot pie!